Some familiar faces are returning to Syfy. 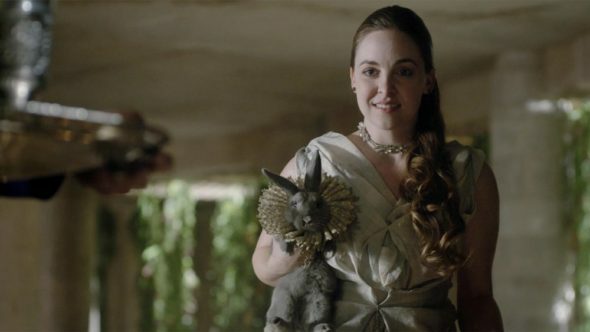 Deadline reports Brittany Curran (pictured) and Trevor Einhorn have been promoted to series regulars for season three of The Magicians. Based on the books by Lev Grossman, the supernatural drama is set at the secret Brakebills University for students of magical ability. The cast includes Jason Ralph, Stella Maeve, Olivia Taylor Dudley, Arjun Gupta, Hale Appleman, Summer Bishil, Jade Tailor, and Rick Worthy. Since season one, Einhorn has played Josh, “a member of the mysteriously vanished Brakebills University Class of 2016,” and Curran first appeared as Eliot’s (Appleman) wife Fen in season two. Syfy has not yet announced a premiere date for season three of The Magicians. Season two just finished in April. What do you think? Are you a fan of The Magicians? Are you glad Josh and Fen will be back? I LOVE LOVE LOVE this show. I know the “ratings” do NOT reflect the loyalty of the audience. I get pissy when the season finale comes around and I have to wait until next year for new episodes. I’m in the Midwest, I know my son’s family (San Francisco) watch as well. He’s the ultimate analyst, so each episode is thoroughly discussed. We would be devastated if you didn’t bring the show back. We are totally vested in the characters and storyline.